This is one of the least-populated regions of the province, home to just over 72,500 people or 1.6 percent of the provincial population. The largest city in the region is Fort St. John, with a population of 18,609. When the North West Company set up a trading post here in 1794, Fort St. John became the first non-native settlement in mainland B.C. The city is an important gateway to the north and its many business and recreational services support the population in the surrounding area. Travelling to Fort St. John from Vancouver takes 14 hours by car or just under two hours by plane. Dawson Creek (population 11,584) is the second-largest city in the region. This city is a one-hour drive from Grande Prairie, a city of 55,000 people just over the border in Alberta. Dawson Creek is Mile Zero of the 2,400-kilometre Alaska Highway that extends to Fairbanks, Alaska. 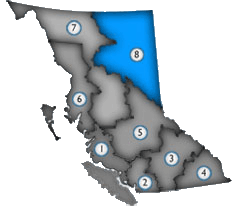 Other cities and towns include Tumbler Ridge (population 2,710), Chetwynd (population 2,635) and Fort Nelson (population 3,902), one of the most northerly towns in the province.